I just downloaded Sublime Text Editor, and I unpacked the tarball. 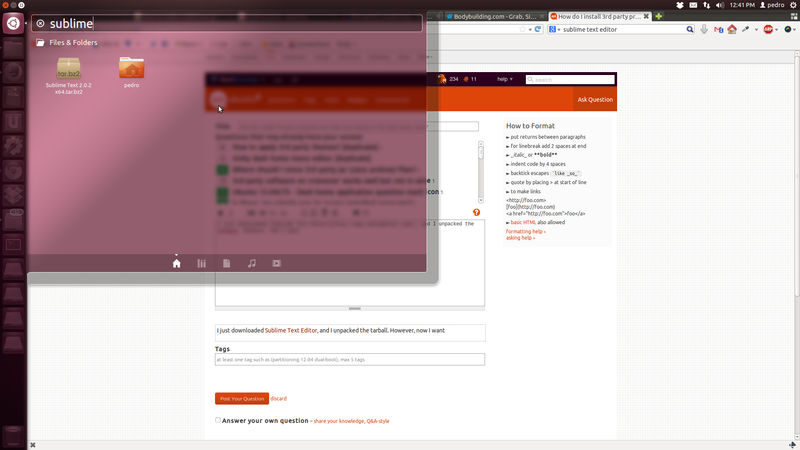 However, now I want to make it searchable in the Dash Board menu, like all applications that are installed using the Ubuntu Software Center. How do I do it? where XXXX is the build number (currently 3059) and YYYY is either i386 or amd64. This will automatically install Sublime Text in /opt/sublime-text, create a /usr/bin/subl command, and automatically create /usr/share/applications/sublime_text.desktop along with the associated icons. It should also create a launcher in your Unity taskbar. Sublime Text 3 is the future of the editor, and every day more and more plugins and extensions are released or revised on Package Control that are compatible with ST3. If you purchase a license, which is required for long-term use after evaluation, you will also have access to the bleeding edge development releases which are released more frequently than the public beta versions and so are more up-to-date as far as new features and bug fixes are concerned. Sublime Text 2 is basically a finished product as far as development is concerned, and while it is quite stable for most people, many plugins do not work with it, especially those under active development that depend on some of the advanced features that ST3 provides. It's worth noting that ST2 and ST3 can coexist peacefully on the same system, as the plugins and data are stored separately. You obviously can't have two subl commands, but you can rename one of them subl2 or subl3, for example. If you still need to create a .desktop file for ST2, its contents should be as follows. Please note that it assumes you moved the Sublime Text 2 directory from where you unpacked it to /opt/sublime_text_2. If this is not the case, please update the directory paths accordingly. Save the file as sublime.desktop, then use sudo to move it to /usr/share/applications. You may have to log out and then back in, but it should now be available in Unity. Good luck, and if you have any questions please let me know. Not the answer you're looking for? Browse other questions tagged unity software-center unity-dash sublime-text or ask your own question. How to create a “.desktop” file? Why doesn't Dash respect the Main Menu categories? I lost all applications on Dash Home and Software Centers buffers, how to retrieve it? How do I lauch sublime text 2 on ubuntu 12? How do you search the Ubuntu Software Center from the Unity Dash? Why Software Center installs application temporarily? Why does dconf-editor never appear in the dash? How to install tar ball sublime text on Ubuntu?